The Philosopher's Stone is a compilation album by Northern Irish singer-songwriter Van Morrison released in 1998 (see 1998 in music). The songs released on this 2-CD thirty-track album were previously unreleased outtakes from 1969 to 1988. The album features twenty-five songs that had never been released and alternative renditions of "The Street Only Knew Your Name" (Inarticulate Speech of the Heart), "Wonderful Remark" (The Best of Van Morrison), "Real Real Gone" (Enlightenment), "Joyous Sound" (A Period of Transition), "Flamingos Fly" (A Period of Transition) and "Bright Side of the Road" (Into the Music). Three songs on the album were evidently intended for Morrison's unreleased 1975 album Mechanical Bliss. "Twilight Zone", "Foggy Mountain Top" and "Flamingos Fly" were all mixed in 1974 just before Mechanical Bliss was due to come out. The Philosopher's Stone, Volume One was originally scheduled to be released in July 1996. When it was released, some of the tracks had been changed; "When I Deliver", "John Brown's Body" and "I'm Ready" were replaced by "The Street Only Knew Your Name", "Western Plains" and "Joyous Sound". "John Brown's Body" and "I'm Ready" were eventually released as B-sides on Morrison's 1999 single "Back on Top". "It's hard to work out why you didn't put something out at the time. Usually it felt like it didn't fit...When I was with Warner Brothers they were very minimalist." 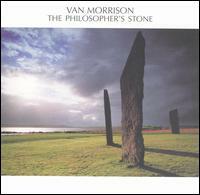 The Van Morrison song titled "Philosopher's Stone" does not appear on this album, but is from 1999's Back On Top, released one year after this album. Many of the recording dates on the album notes are disputed by one of Morrison's biographers, Heylin. "Really Don't Know" he claims was recorded in 1969, not 1971 as he only has details of the musicians recording with Morrison in 1969. Heylin feels that tracks from "Wonderful Remark" to "Drumshanbo Hustle" were recorded in 1972 not 1973, and that "There There Child" was recorded in 1972 not 1976. On disc two "John Henry" is shown as recorded in 1977, but Heylin argues that it was recorded two years earlier, as there are no details on Morrison recording in 1977. "Crazy Jane on God" was recorded with Moving Hearts in 1983 for the album A Sense of Wonder. From the same sessions the songs "A Sense of Wonder" and "Boffyflow and Spike" were used for the album. The recording date of these songs was 1983 (as stated on the album itself) but the date on The Philosopher's Stone states "Crazy Jane on God" was recorded in 1984. Everything about The Philosopher's Stone, from its format to its packaging to its song selection, seems designed to divorce the tracks from their historical milieu...When we open the package, there are no essays, no interviews, no archival photos — just lyrics (often incorrectly transcribed) and credits which include the year of the session. All songs written by Van Morrison unless noted. Ronnie Montrose – guitar, background vocals on "Wonderful Remark" and "Ordinary People"
^ Tony Scherman (19 June 1998). "Entertainment Weekly review". Ew.com. Retrieved 6 March 2012. ^ Wild, David (18 May 1998). "Van Morrison: The Philosopher's Stone". Album reviews. Rolling Stone. Archived from the original on 21 September 2017. Retrieved 18 July 2011. ^ "Rick Shlosser – About". rickshlosser.com. Retrieved 7 June 2010. This page was last edited on 21 February 2019, at 06:29 (UTC).